The Fall Creek Subdivision is a new home community in Southwest Meridian, Idaho. The neighborhood offers homeowners a convenient location, easy freeway access and great proximity to shopping. Fall Creek is adjacent to the new Victory Middle School which opened in Fall 2016. The brand new community pool and clubhouse are open along with the playground. Homes for sale in Fall Creek offer a wide variety of interior and exterior options: from mudrooms to double sinks, fireplaces and kitchen islands to make your home fit your lifestyle. View our Meridian homes for sale or read more about Fall Creek real estate below. Similar communities include the Bellano Creek subdivision (Meridian) and Timbermist (Kuna). Find your new home in Meridian, hundreds of new homes to search! 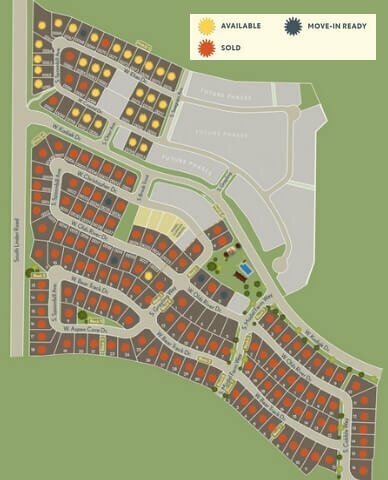 Homesites: This 72.55-acre community offers 176 building lots ranging in size from 0.149 acres (6,490 Sq. Ft.) up to 0.801 acres (34,890 Sq. Ft.). Phase 6 coming in Spring 2019. South on Meridian Rd toward Overland Rd. Turn right onto W Overland Rd. Turn left onto S Stoddard Rd, then right onto W Kodiak Dr. Phase 5 was just released and lots are going fast. For the best selection, do not delay - contact us online or call a Meridian new construction specialist at (208) 391-4466 today.